Day 49: Isolation of movement. We began today with a movement workshop with Avye Leventis on movement isolation. This workshop took me back to my Physical theatre training days. We began by charging the room with energy using our whole bodies to push energy around the space. We examined our bodies when pushing a wall, looking at alignments, and oppositions in the body, and transferred this into puppets, and explored the physicality of the push in our bodies as puppeteers; taking the tension out of us and putting the movement into the puppet and vice versa. We looked at the limitations of the puppet (like short arms in relation to body, so if you translate physical human movement into the puppet it doesn’t read) and how we create believable movement in the puppet. Avye showed us a technique to produce believable emotional physicality without us as performers emotionally investing; allowing us to be able to repeat emotional scenes again and again for an audience without exhausting ourselves. Avye then talked us through using the four elements to create movement and explore how these could be used to create character which could be transferred into puppets just like it is performers. We were led through a number of body isolation exercises; it became clear to me how important our eyes were in these exercises, and for me this related specifically to shifting focus between puppet and performer, definitely something I will use to help get me into shifting focus frame of mind. We had our second sessions on our small projects today; my first session for my solo 2in1 wasn’t particularly fruitful. But we had some breakthroughs today. I’m using Rex a bone dinosaur/bird and in our first session, even though I have played with Rex before, I found it very difficult to get into the rhythm of him. Today I took a different tact, throughout our whole session I just listened to music and just let the music inspire the movements Rex can do. This freed me up a lot; it was nice to be in a room of lots of people and be in a bit of a bubble, there but partly removed and allowed me to feel like it was just Rex and I in the space. I feel like we got a lot of the ground work done, and know Rex a lot better. Howard Gayton is here with us for the next two days, teaching us about the Puppet as mask. 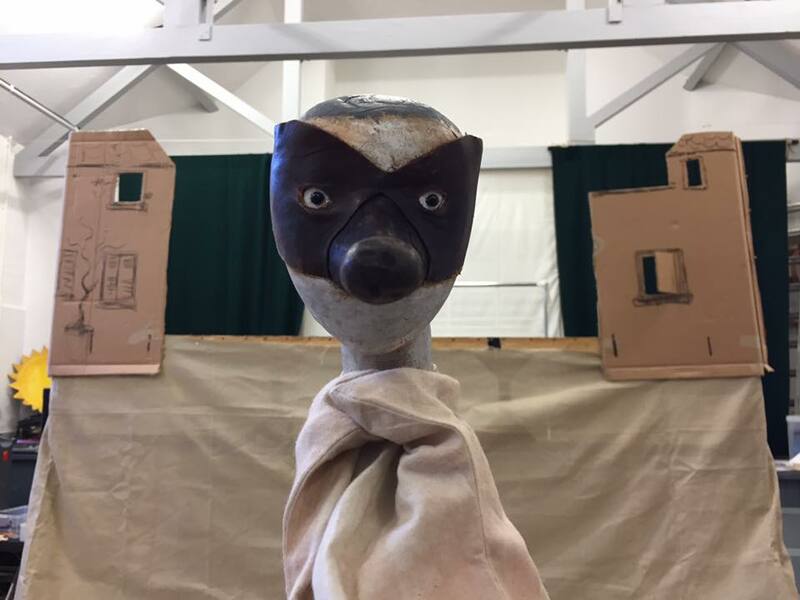 We are using glove puppets, which look like characters from Commedia dell’arte which is a form of improvised theatre with stock characters (from Italy) and is traditionally performed with performers wearing character masks, this limitation forces them to physically portray the character. Before we handle the puppets we warm up the space, using lots of eye contact and big smiley faces, the place is charged with energy as we begin to move around. Howard then introduces us to the first Commedia dell’arte character we will be exploring, Zanni; this character is the servant/slave, they are always very happy, always hungry, terrified of their master, and are a bit naïve. We physicalize the character in ourselves, and then transfer this movement into our hands, then the puppets. We use the play board with the Zanni’s and explore entrances and exits. Howard is really encouraging us to be brave and really use our voices; it’s amazing how being shielded from your audience can really help you let go. We find games that the Zanni’s can play together, and create a little scene; characters enter, play game and exit. We perform the games and then are given feedback to rework and present again. These puppets are great, I’ve not used glove puppets much other than the one day we have had with Sarah on the course so far. They allow a lot of freedom; they get away with a lot “it’s not you doing it, it’s the puppet”, they are coarse but not crude. The puppet booth acts as the mask for the puppeteer and all you have is your hand for expression. The puppet is an extension on us, physically linked. It’s fascinating! Day 51: Puppet as mask; Zanni and the Lovers. Our second day with Howard today, we began by working on our technique; with turns and looks and establishing eye lines. Also for those of us with hands a little smaller, we were given some foam to make a tool/stuffer so our fingers could fit more comfortably inside the neck of the puppet; this allows a lot more control and limits the possibility of the head of the puppet coming off your finger. When we weren’t using the puppets you could see lumps of foam stuffed in socks, up sleeves and down tops; was very amusing. We went through physically the character of the Zanni, and to this we add the Young Lovers. Like in Romeo and Juliet at the beginning the young lovers are lustful and innocent, and cannot be together; they move in long waves and sighs almost floating on love. We then create a performance using the Young lovers and One/two Zanni’s; like Romeo and Juliet these two characters cannot be together, but are drawn together and use their servants (Zanni) to be the go between. I was the role of the Zanni in my group; who is sent by his master to go and retrieve his love from her house. She (Samantha) is asleep, and the Zanni tries to wake her up gently but it does not work, so yells at her to wake her up; this causes panic and in all the confusion Zanni mistakes the Female young lovers reaction for love of him. We presented the piece and then were given time to rework it, this allowed us to really heighten the emotion of the Zanni, and find points for the Zanni to share his feelings with the audience with looks and really make a bigger action/reaction of Zanni going in for a kiss with Samantha. I think the thing that I will take away most from these two days, is to keep the element of fun in what I do and to really be in the moment, these puppets are very responsive to everything around them and that really adds to the “aliveness” of them. Day 52: Projects 1 and 2; Things got difficult. Today we have spent time working on both of our projects (for me this is My solo 2 as 1 performance and Group shadow performance) for the end of term sharing. The mood changed quite significantly today; the stress in the space was palpable (which I think was a direct result of the madness and fun of the past two days and then going back into studied precise work). Rene was back too, and she and Sarah were ready to watch and analyse and feedback into what we were creating; I know that some groups found this difficult. Ultimately Rene and Sarah are taking on the role of director for us. It is important to be flexible and open about what you are making, and it is important to remember the role of an outside eye and the director is not to destroy your work. If you are clear about what you are making, and what you want the audience to read, they will tell you if they feel you are doing what you have set out to do. If not they will help you find a way to do it. But it can be difficult if your director is not there all the time as they are working with umpteen different projects simultaneously; they are not privy to all the changes you make and the discoveries you make. Despite this I had quite a good first session; I began to play with the idea that perhaps I was going to eat Rex, and played with the danger of Rex a little. However in the Shadow group I feel we spent a lot of time just going over things we had already done, no new decisions were made and I felt this was a direct response to the morning project session which had been very difficult for some. We began with a group warm up; playing volley ball which was really good and I feel we all really needed it. With all the concentrated work we have been doing on our projects we have become a little distant from each other, and it’s important to remember we are a group, a community. Then a good chat was had with everyone, a few concerns about the sharing at the end of the course were aired, and I think we all got a clearer understanding what was expected of us. Ultimately what we are creating is for us, the sharing is an informal performance, but it is a performance, there will be lights, and an audience, and both Sarah and Rene are shaping the performance to ensure it shows us off in the best light. The Shadow group then spent some time with Stephen Tiplady; going through all the material we had created, in an order to create a story. I took notes on every transition, change of light etc. and we decided on an ending for the performance. We worked quickly and really got a lot done, and it was great to get feedback from Stephen on how it all worked. Also through our time with him it became very clear that we would need a technician throughout our piece to bring lights in and out to get the effects we wanted. I spent the afternoon working on my solo 2 as 1, I didn’t write much in my note book about this; in fact all I wrote was “I’m going to cook Rex” then after the session “No I’m not!” I had worked out a scenario where wearing gloves I would remove Rex from a box, examine him and then force him to go into a pot. It became clear that actually I wasn’t allowing Rex to be Rex and after a good discussion with Rene, seeing what I already had in material, it became clear that actually the relationship between Rex and I was a lot closer. I am quite relieved if I’m honest because I felt quite guilty about cooking him. Today was spent creating a group performance; the aim is to bring back as many characters from the past ten weeks as we can. We were asked a few days ago to write a list of characters we would like to see as part of the performance. Sarah has narrowed this list down and created a running order for us to work through today. This part of the performance also allows us to show off the puppets we have made with Lyndie; who are going to be at a bus stop. For my part in this performance I have ended up doing a second 2 as 1 piece; I am reinterpreting a performance by one of my class mates Mae who cannot be with us for the performances, with one of Rene Bakers puppets (Bone dog) basically I eat popcorn and he watches intently. Also as part of the performance I’m working with Eoin as we recreate a confession; I’m operating the Priest listening to an elderly lady talk about her illicit thoughts. Also as part of the performance we are bringing back all the choruses we created with Anna Murphy; the cyclists are going to be used as a bridge between scenes. There will also be an appearance of our Young lovers and Zanni from our work with Howard. It’s nice to see different elements from the course all coming together, although we didn’t get through all the characters we had intended. I feel there is a good variation of puppetry styles etc. in the “New Day” performance, and it really highlights the fun and exciting discoveries we have made throughout the course.